The only way you should ever eat persimmons. So as most of you know, I work as a cashier at my local health food store. We stay pretty busy, but as you can imagine some days are busier than others. I'm the opening cashier on Saturday mornings, which are pretty dead until about 11. I was chatting with my best friend at work (not surprisingly the produce guy, haha! ), about the luscious looking persimmons we just got in. I told him I've only ever had one in my life and HATED IT--it was so chalky! He told me I ate it too early, and then went to show me how to pick a persimmon at peak ripeness (when they're so squishy they're getting ready to pop!). He told me his fave way to eat them is to literally stick the whole thin in the freezer overnight, then dump it in a bowl and eat it like sorbet. So I took one home and tried it. And my life will never be the same. So there ya have it guys--the "unrecipe recipe" for this week :) try it out! And enjoy! Persimmon Sorbet. For Andrew :) Vegan, gluten-free. Serves one. 2. Remove from freezer and let thaw 10-15 minutes. 3. Place in bowl and scoop out with spoon. Enjoy! Sometimes vegetables are just asking to be stuffed...come on. You guys know what I'm talking about: a giant zucchini, a cute patty pan squash, a pie pumpkin, and in my case (and in the case of this recipe! ), a beautifully round globe eggplant. Stuffed anything is super fun--I got quite creative with the spice combo for this one! You can get creative, too! More of one spice, less of another...even different spices altogether. It's up to you! Have fun...and as always, enjoy. 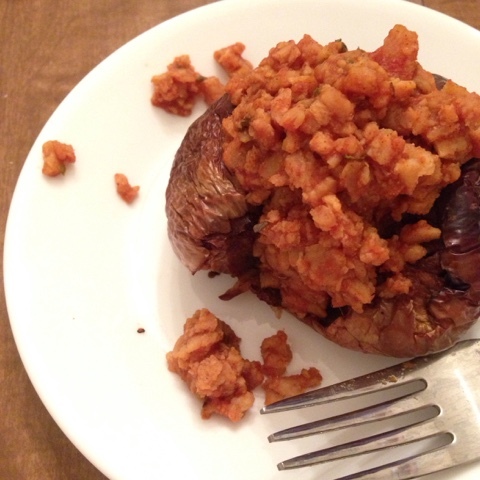 Simple Stuffed Eggplant. Vegan, Gluten-free. Serves one. 1. Preheat oven to 400 degrees F and mine a baking sheet with parchment. and roast for 20 minutes. Remove and let cool 10 minutes, until cool enough to handle. 3. Gently scoop out inner flesh off eggplant and discard. 4. In a medium size bowl, combine tvp and water and microwave for one minute. 5. 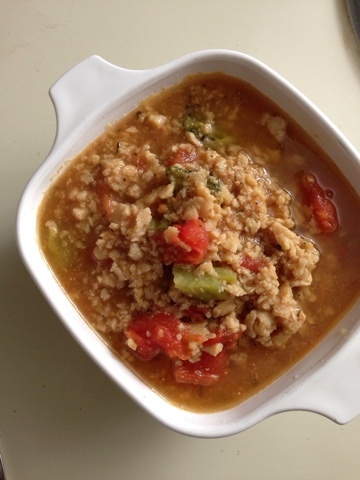 In a small soup pot, combine tvp with remaining ingredients, plus a generous splash of water. Mix over medium low heat until fragrant and well combined. 6. 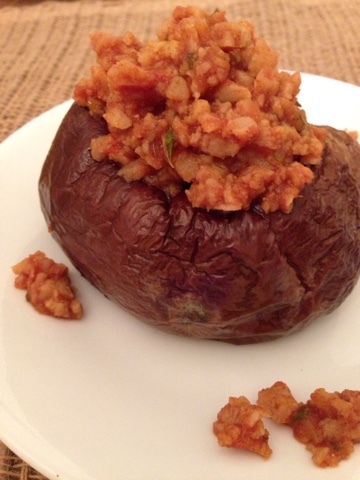 Place "meat" mixture in eggplant and serve with tomato based pasta dish or crusty bread. Tuscan Spiced White "Beananini". Vegan, Gluten-free. Serves one. 1. Combine beans, spices, aminos, and water in mini food processor and blend until smooth, scraping sides as you go. 2. Spoon out and spread onto one slice of bread. Place second slice on top. 3. 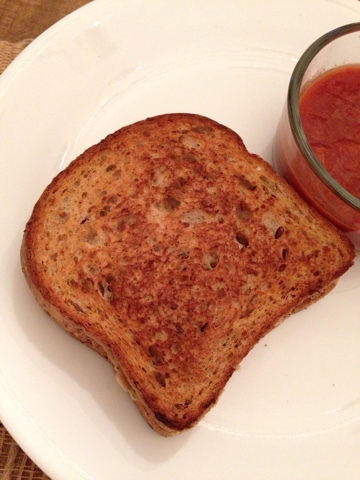 Toast sandwich over medium heated nonstick skillet for about 3 minutes per side, or until desired level of "toastiness" is reached. Serve warm with dipping sauce. 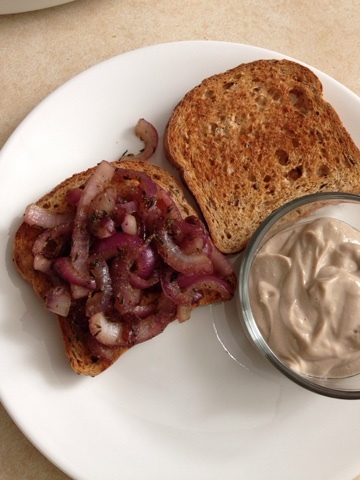 Caramelized Red Onion Sandwich with Balsamic Cream Dip. Ever had a craving? And I don't mean a craving for something...normal, like popcorn or nice cream. I mean a weird craving. Like a...date I say it...PREGNANCY CRAVING. And before your eyes jump out of your face, I can happily assure you that I AM DEFINITELY NOT PREGNANT. Or plan on being ANYTIME SOON. But I swear...sometimes the things I crave make me wonder. Take this little sammie into account. 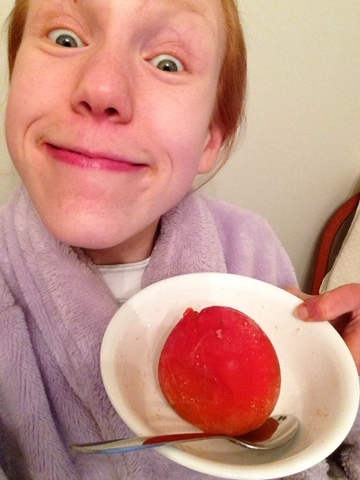 Really Anna?! An onion sandwich?! And yep, a delicious, caramelized, ooey-gooey luscious onion sandwich. Complete with tangy balsamic cream for dippage. Holy. Caramelized Red Onion Sandwich with Balsamic Cream Dip. Vegan, gluten-free option. Serves one. 1. Heat a nonstick skillet over medium heat. Test the heat of your pan by adding a drop of water. If it sizzles of, congratulations: your pan is heated! 2. Add 3 T water and aminos to pan. Toss in your sliced onions and sprinkle thyme over top. Fold continuously with spatula, adding more water if needed, until caramelized. Set aside off of heat and let cool. 3. In your food processor, combine tofu, balsamic, and onion/garlic powders. Blend until completely smooth and creamy. Spoon into small ramekin. 4. Place onions on top of bread, toasted if desired, and serve with cream on the side. Enjoy! My daily lunch consists of a salad. ALWAYS and without fail! But on my days off from work--when I can actually fix lunch instead of pack lunch, I go wild. Now don't get me wrong--salads are wonderful. I love my salads...like, MEGA LOVE. But when the weather gets chillier, there's nothing more perfect than snuggling into a steaming bowl of delicious soup as you watch your favorite movie. In your pajamas and slipper socks, of course ;) enjoy guys! Now come on--HOW DELISH IS THIS? Quick Lemon Pepper Chili. Vegan, gluten-free. Serves one. 1. This chili can be made in 10 minutes y'all. Start to finish! Ready, set, go! Okay, combine tvp with onion and garlic and mix. 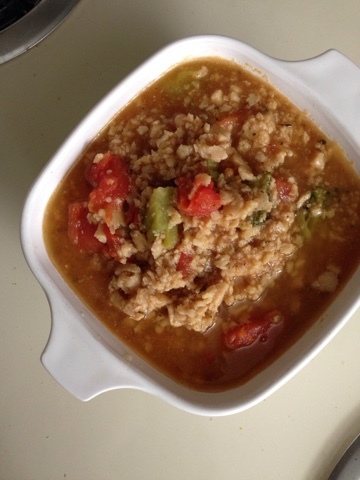 Add water and aminos and pop in the microwave for 2 minutes. 2. Once cooked, scoop tvp meat into a small soup pot and add all ingredients EXCEPT TOMATO. Bring to a boil over high heat. 3. When at a rolling boil, reduce heat to medium and add chopped tomato. Stir well and cook over low heat for 7 minutes. 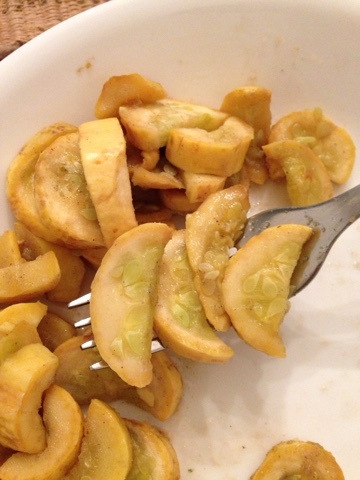 Lazy girl's "Unsauteed Squash." Vegan, Gluten-free. Serves one. 1. You're not gonna believe how easy this is...it's too good to be so simple! Ok. Just combine your squash moons in a medium size microwave safe bowl with the aminos and spices of choice.